Download "What this Ruling is about"
1 Page status: legally binding Page 1 of 12 Class Ruling Income tax: return of capital: Alliance Resources Limited Contents LEGALLY BINDING SECTION: Para What this Ruling is about 1 Date of effect 7 Scheme 8 Ruling 30 NOT LEGALLY BINDING SECTION: Appendix 1: Explanation 36 Appendix 2: Detailed contents list 67 This publication provides you with the following level of protection: This publication (excluding appendixes) is a public ruling for the purposes of the Taxation Administration Act A public ruling is an expression of the Commissioner s opinion about the way in which a relevant provision applies, or would apply, to entities generally or to a class of entities in relation to a particular scheme or a class of schemes. If you rely on this ruling, the Commissioner must apply the law to you in the way set out in the ruling (unless the Commissioner is satisfied that the ruling is incorrect and disadvantages you, in which case the law may be applied to you in a way that is more favourable for you provided the Commissioner is not prevented from doing so by a time limit imposed by the law). You will be protected from having to pay any underpaid tax, penalty or interest in respect of the matters covered by this ruling if it turns out that it does not correctly state how the relevant provision applies to you. What this Ruling is about 1. This Ruling sets out the Commissioner s opinion on the way in which the relevant provision(s) identified below apply to the defined class of entities, who take part in the scheme to which this Ruling relates. Relevant provision(s) 2. The relevant provisions dealt with in this Ruling are: subsection 6(1) of the Income Tax Assessment Act 1936 (ITAA 1936) section 45A of the ITAA 1936 section 45B of the ITAA 1936 section 45C of the ITAA 1936 section of the Income Tax Assessment Act 1997 (ITAA 1997) section ITAA 1997, and Division 855 of the ITAA All legislative references are to the ITAA 1936 unless otherwise stated. 2 Page 2 of 12 Page status: legally binding Class of entities 3. 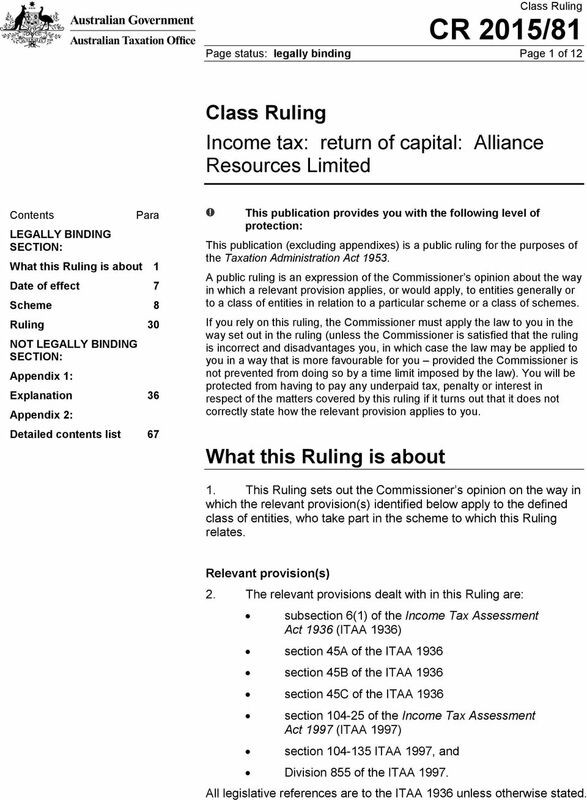 The class of entities to which this Ruling applies is the holders of ordinary shares in Alliance Resources Limited (Alliance) who: are registered on the Alliance share register on 14 October 2015 (the Record Date) are entitled to participate in the return of capital hold their Alliance shares on capital account, and are not subject to the taxation of financial arrangements rules in Division 230 of the ITAA 1997 in relation to gains and losses on their Alliance shares. (Note: Division 230 of the ITAA 1997 will generally not apply to individuals, unless they have made an election for it to apply to them) In this Ruling, a person belonging to this class of entities is referred to as an Alliance shareholder. Qualifications 4. The Commissioner makes this Ruling based on the precise scheme in this Ruling. 5. The class of entities defined in this Ruling may rely on its contents provided the scheme actually carried out is carried out in accordance with the scheme described in paragraphs 8 to 29 of this Ruling. 6. If the scheme actually carried out is materially different from the scheme that is described in this Ruling, then: this Ruling has no binding effect on the Commissioner because the scheme entered into is not the scheme on which the Commissioner has ruled; and this Ruling may be withdrawn or modified. Date of effect 7. This Ruling applies from 1 July 2015 to 30 June The Ruling continues to apply after 30 June 2016 to all entities within the specified class who entered into the specified scheme during the term of the Ruling. However, this Ruling will not apply to taxpayers to the extent that it conflicts with the terms of a settlement of a dispute agreed to before the date of issue of this Ruling (see paragraphs 75 and 76 of Taxation Ruling TR 2006/10). 3 Page status: legally binding Page 3 of 12 Scheme 8. The following description of the scheme is based on information provided by Alliance. Note: certain information has been provided on a commercial-in-confidence basis and will not be disclosed or released under Freedom of Information legislation. 9. Alliance is an Australian resident company which was incorporated on 24 March 1994 and listed on the Australian Securities Exchange (ASX) since 19 October Its principal activity includes uranium mine development and exploration of minerals. 10. Alliance is the head company of a tax consolidated group that was formed on 1 July Alliance Craton Explorer Pty Ltd (ACE) is a wholly owned subsidiary of Alliance and a member of the tax consolidated group since its formation on 1 July On 30 August 2002, ACE entered into a joint venture agreement (the Joint Venture) over EL2874 and what subsequently became known as the Four Mile uranium project. The purpose of the joint venture was to explore and mine an area located 550 kilometres north of Adelaide in South Australia (the Project). 12. ACE s joint venture interest in the Joint Venture was 25%. However, in an announcement made to the ASX on 20 November 2014, Alliance confirmed that as a result of its decision not to contribute to the Project s 2015 Program and Budget, ACE s interest in the Joint Venture will reduce from 25% to approximately 15% by 31 December On 14 July 2015, ACE entered into a Sale and Purchase Agreement (SPA) with the other Joint Venture partner (the JV partner) to sell to this partner all of ACE s interest in the Joint Venture for $ million (the Sale). The Sale was subject to a number of conditions which included the approval of the Sale by the shareholders of Alliance. 14. In an announcement made to the ASX on 11 August 2015, Alliance called for an extraordinary general meeting of its shareholders to vote on a resolution approving the Sale and if this was approved, to vote on a resolution involving the return of capital by way of an equal reduction in share capital pursuant to sections 256B and 256C of the Corporations Act An Explanatory Statement was also attached to the announcement. 15. According to the Explanatory Statement, the Sale will deliver a cash consideration to Alliance that is greater than the net book value of the Project. The Sale may also affect Alliance s ability to remain listed on the ASX, as it may no longer meet the trading activity requirements following the Sale. 4 Page 4 of 12 Page status: legally binding 16. The Explanatory Statement also provided information on the 2014 legal proceedings brought by ACE against the JV partner. One of the objectives of the 2014 legal proceedings was to seek a declaration that the termination of the JV partner s appointment, as the sales and marketing agent of ACE s share of product mined at the Project, was valid. Background leading to the 2014 legal proceedings was provided in an announcement made to the ASX on 20 November 2014 (the ASX announcement). 17. According to the ASX announcement, the JV partner s appointment was terminated because of its refusal to comply with the direction of ACE to sell ACE s share of the uranium concentrate which had been shipped to Canada for conversion. The ASX announcement also stated that ACE has always proceeded on the basis that revenue from the sale of its share of product mined at the Project would cover a substantial part, if not all, of its share in the expenses of the operation of the Project. 18. A stay of the 2014 legal proceedings was granted in accordance with the terms of the Sale. 19. Both resolutions were approved on 11 September The sale was completed on 18 September Following the Sale, Alliance s operations will consist of only two exploration project areas in northern Chile, considered to be potential prospects for copper, gold, silver and uranium. Return of capital 21. Alliance will make a return of capital of $50,060, equating to $0.12 per share assuming there are 417,173,773 shares on issue as at the Record Date (the return of capital). 22. Alliance will not return capital of any more than $0.12 per share at this time until Alliance has determined its tax liability in respect of the Sale, which will not be finalised until after the end of the income year ended 30 June The return of capital will be paid equally to each holder of an Alliance share who is registered on the Alliance share register on the Record Date. The date for the return of capital (Payment Date) is 28 October No shares will be cancelled and the number of shares held by each shareholder will not change as a result of the return of capital. No fractional entitlements will arise from the return of capital. 24. The return of capital will be debited in full against Alliance s share capital account and funded entirely from the cash proceeds of the Sale. Alliance has confirmed that its share capital account (as defined in section of the ITAA 1997) is not tainted within the meaning of Division 197 of the ITAA 1997. 5 Page status: legally binding Page 5 of 12 Financial and other information 25. Alliance has a single class share capital structure consisting of fully paid ordinary shares. As at the Record Date, Alliance s paid up share capital is $108,686, As at 9 October 2015, Alliance had 417,173,773 ordinary shares on issue which were trading at a price of $0.15, providing a market capitalisation of $62,576, Given Alliance s overall loss position, it has not historically declared or paid a dividend to its shareholders. Alliance s franking account balance was nil as at 1 October No movements in the franking account are projected up to the time of the return of capital. 28. Alliance has not forecasted the declaration of a dividend to its shareholders in the foreseeable future, based on its future business operations. 29. As at 30 June 2015, approximately 3.7% of Alliance s shares were held by foreign resident shareholders. 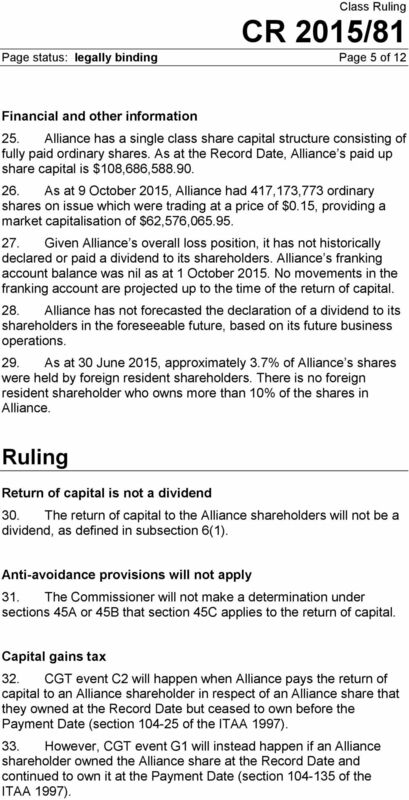 There is no foreign resident shareholder who owns more than 10% of the shares in Alliance. Ruling Return of capital is not a dividend 30. The return of capital to the Alliance shareholders will not be a dividend, as defined in subsection 6(1). Anti-avoidance provisions will not apply 31. The Commissioner will not make a determination under sections 45A or 45B that section 45C applies to the return of capital. Capital gains tax 32. CGT event C2 will happen when Alliance pays the return of capital to an Alliance shareholder in respect of an Alliance share that they owned at the Record Date but ceased to own before the Payment Date (section of the ITAA 1997). 33. However, CGT event G1 will instead happen if an Alliance shareholder owned the Alliance share at the Record Date and continued to own it at the Payment Date (section of the ITAA 1997). 7 Page status: not legally binding Page 7 of 12 Appendix 1 Explanation This Appendix is provided as information to help you understand how the Commissioner s view has been reached. It does not form part of the binding public ruling. Return of capital is not a dividend 36. The term dividend is defined in subsection 6(1) and includes a distribution made by a company to any of its shareholders. However, paragraph (d) of the definition of dividend excludes a distribution that is debited against an amount standing to the credit of the share capital account of the company. 37. As the return of capital will be recorded as being wholly debited to Alliance s share capital account, the return of capital of $0.12 per share will not be a dividend. Anti-avoidance provisions will not apply 38. Sections 45A and 45B are two anti-avoidance provisions which, if they apply, allow the Commissioner to determine that all or part of a distribution is treated as an unfranked dividend. Section 45A 39. 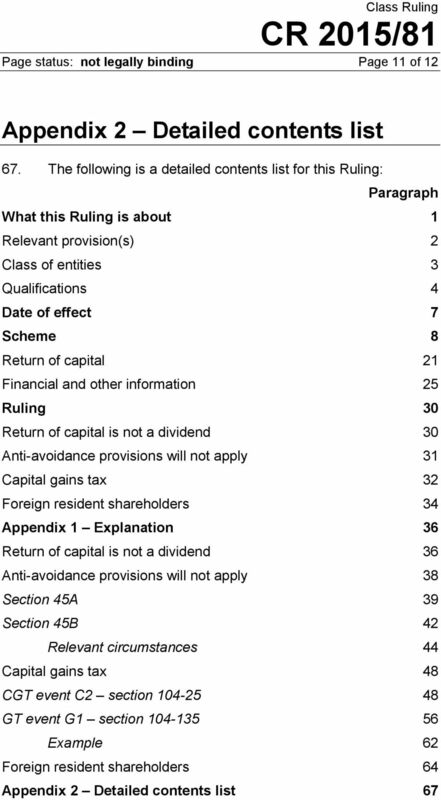 Section 45A applies where capital benefits are streamed to some shareholders (the Advantaged Shareholders), who would derive a greater benefit from the capital benefits than other shareholders (the Disadvantaged Shareholders) and these Disadvantaged Shareholders receive, or are likely to receive, dividends. 40. As Alliance will make a pro-rata return of capital to all of its shareholders in respect of their ordinary shares, there will not be streaming of capital benefits to some shareholders and not to others. 41. Accordingly, the Commissioner will not make a determination under subsection 45A(2) that section 45C applies. Section 45B 42. Section 45B applies where certain capital payments are made to shareholders in substitution for dividends. In broad terms, there needs to be a scheme in which, having regard to the relevant circumstances of the scheme, it would be concluded that the person, or one of the persons, who entered into the scheme or carried out the scheme or any part of the scheme did so for a purpose, other than an incidental purpose, of enabling the relevant taxpayer to obtain a tax benefit. 8 Page 8 of 12 Page status: not legally binding 43. As a return of capital will generally result in a lesser amount of tax payable than a dividend, Alliance Shareholders will obtain a tax benefit within the meaning of subsection 45B(9). Relevant circumstances 44. Subsection 45B(8) lists the relevant circumstances of the scheme which the Commissioner must have regard to when determining whether or not the requisite purpose exists. 45. Having regard to these relevant circumstances, it cannot be concluded that Alliance will enter into or carry out the scheme for a more than incidental purpose of enabling the Alliance shareholders to obtain a tax benefit. 46. Although the Sale will generate profits for Alliance, the commercial circumstances of the Sale indicate that enabling shareholders to obtain a tax benefit is no more than an incidental purpose of entering into, or carrying out, the scheme. These circumstances include: the dilution of ACE s joint venture interest over time if it continues its participation in the Project without making further contributions to the expenses of the Project. For example, as a result of its decision not to contribute to the Project s 2015 Program and Budget, ACE s interest in the Joint Venture will reduce from the current 25% to approximately 15% by 31 December 2015 the 2014 legal proceedings instituted by ACE which were caused by ACE s inability to fund its share of the expenses in the operation of the Project from the proceeds of the sale of the product mined at the Project, and after the Sale which is considered a disposal of its significant income generating asset, Alliance will be left only with exploration assets in Chile. 47. Accordingly, the Commissioner will not make a determination under subsection 45B(3) that section 45C applies. Capital gains tax CGT event C2 section The right to receive the payment of the return of capital is one of the rights inherent in an Alliance share at the Record Date. If, after the Record Date but before the Payment Date, an Alliance shareholder ceases to own some, or all, of their shares in Alliance, the right to receive the payment of the return of capital in respect of each of the shares disposed of will still be retained by the shareholder and is considered to be a separate CGT asset. 9 Page status: not legally binding Page 9 of CGT event C2 will happen when the return of capital is paid. The right to receive the payment (being an intangible CGT asset) will end by the right being discharged or satisfied when the payment is made. 50. An Alliance shareholder will make a capital gain if the capital proceeds from the ending of the right are more than the cost base of the right (subsection (3) of the ITAA 1997). 51. The capital proceeds will be the return of capital of $0.12 per share (subsection (1) of the ITAA 1997). 52. The cost base of the right to receive the return of capital will be nil as Alliance shareholders did not incur any costs to acquire that right (Division 110 of the ITAA 1997). Therefore, a capital gain equal to the amount received as the return of capital is likely to arise. 53. The cost base of the right does not include the cost base or reduced cost base of the share previously owned by the Alliance shareholder that has been applied in working out a capital gain or capital loss made when a CGT event happened to the share for example, when the Alliance shareholder disposed of the share after the Record Date. 54. As the right to receive the return of capital was inherent in the Alliance share during the time it was owned, the right is considered to have been acquired at the time when the share was acquired (section of the ITAA 1997). 55. If the Alliance share was originally acquired by an Alliance shareholder at least 12 months before the payment of the return of capital, a capital gain from CGT event C2 happening to the right may qualify as a discount capital gain under subsection (1) of the ITAA 1997, provided the other conditions in Subdivision 115-A of the ITAA 1997 are satisfied. CGT event G1 section CGT event G1 happens when a company makes a payment to a shareholder in respect of a share they own and some or all of the payment (the non-assessable part) is not a dividend or an amount that is taken to be a dividend under section Accordingly, CGT event G1 will happen when Alliance pays the return of capital to an Alliance Shareholder in respect of an Alliance share that they own at the Record Date and continue to own at the Payment Date. 58. An Alliance Shareholder will make a capital gain if the return of capital amount is more than the cost base of the shareholder s Alliance share. The amount of the capital gain is equal to that excess (subsection (3) of the ITAA 1997). 59. If an Australian resident shareholder makes a capital gain from CGT event G1 happening, the cost base and reduced cost base of the Alliance share is reduced to nil. An Australian resident shareholder cannot make a capital loss from CGT event G1 happening (subsection (3) of the ITAA 1997). 10 Page 10 of 12 Page status: not legally binding 60. If the return of capital amount is equal to or less than the cost base of the Alliance share at the Payment Date, the cost base and reduced cost base of the ordinary share will be reduced by the amount of the payment (subsection (4) of the ITAA 1997). 61. If the Alliance share was originally acquired by an Alliance shareholder at least 12 months before the payment of the return of capital, a capital gain from CGT event G1 may qualify as a discount capital gain under subsection (1) of the ITAA 1997, provided the other conditions in Subdivision 115-A of the ITAA 1997 are satisfied. Example 62. An Alliance shareholder acquired their shares at two different times for $0.60 and $0.08 per share, and continues to hold those shares at the Payment Date: for shares with a cost base of $0.60 per share, the cost base will reduce to $0.48 per share following the $0.12 return of capital, and for shares with a cost base of $0.08 per share, the cost base will reduce to nil and the shareholder will make a capital gain of $0.04 per share following the $0.12 return of capital. The capital gain may qualify as a discount capital gain under subsection (1) of the ITAA 1997, provided the other conditions in Subdivision 115-A of the ITAA 1997 are satisfied. 63. Shares acquired under the Non-Renounceable Rights Issue announced by Alliance on 2 December 2014 will not qualify as a discount capital gain as the shares were not acquired at least 12 months before the return of capital. Foreign resident shareholders 64. 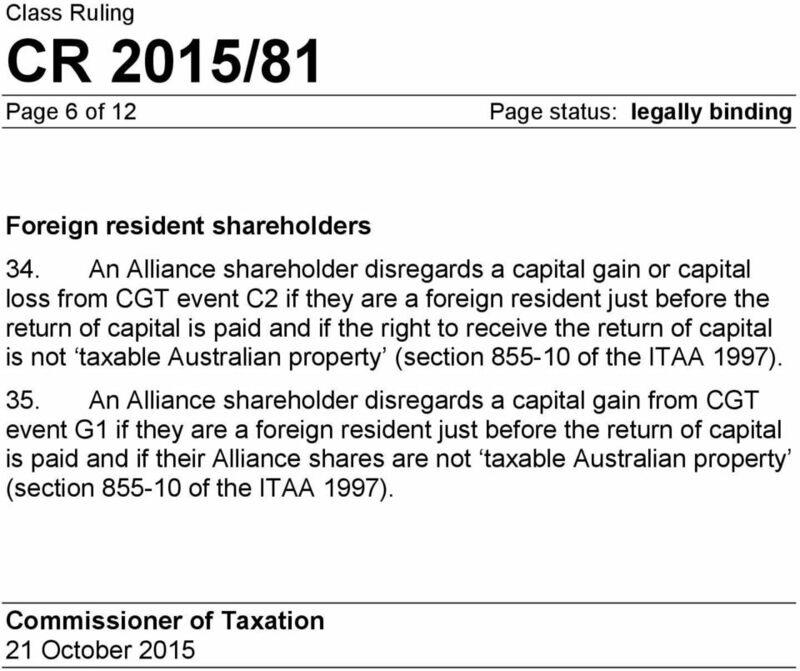 Under section of the ITAA 1997, an entity disregards a capital gain or capital loss from a CGT event if they are a foreign resident just before the CGT event happens, and the CGT event happens in relation to a CGT asset that is not taxable Australian property as defined in the table in section of the ITAA An Alliance shareholder disregards a capital gain or capital loss from CGT event C2 if they are a foreign resident just before the return of capital is paid and if the right to receive the return of capital is not taxable Australian property. 66. An Alliance shareholder disregards a capital gain from CGT event G1 if they are a foreign resident just before the return of capital is paid and if the Alliance shares are not taxable Australian property. 12 Page 12 of 12 Page status: not legally binding References Previous draft: Not previously issued as a draft Related Rulings/Determinations: TR 2006/10 Subject references: - capital benefit - capital gains tax - capital reductions - CGT asset - CGT cost base - CGT events G1-G3 shares - distributions - dividend income - ordinary shares - profits - return of capital on shares - share capital - shareholder payments - unfranked dividends Legislative references: - ITAA ITAA (1) - ITAA A - ITAA A(2) - ITAA A(3) - ITAA B - ITAA B(2)(a) - ITAA B(2)(b) - ITAA B(2)(c) - ITAA B(3) - ITAA B(5)(b) - ITAA B(8) - ITAA B(9) - ITAA C - ITAA ITAA ITAA ITAA (3) - ITAA ITAA (3) - ITAA (4) - ITAA ITAA 1997 Div ITAA 1997 Div ITAA 1997 Div ITAA ITAA (1) - ITAA (1) - ITAA ITAA 1997 Div ITAA 1997 Div ITAA ITAA ITAA ITAA (3) - TAA Corporations Act Corporations Act B - Corporations Act C ATO references NO: 1-790LXPS ISSN: ATOlaw topic: Income tax ~~ Capital gains tax ~~ CGT events ~~ CGT events C1 to C3 - end of a CGT asset Income tax ~~ Capital gains tax ~~ CGT events ~~ CGT events G1 to G3 - shares AUSTRALIAN TAXATION OFFICE FOR THE COMMONWEALTH OF AUSTRALIA You are free to copy, adapt, modify, transmit and distribute this material as you wish (but not in any way that suggests the ATO or the Commonwealth endorses you or any of your services or products). The reasons for the Directors recommendation are set out in detail in the Scheme Booklet. If you decide not to participate in the Buy-Back you are not required to take any action and your Shareholding in IBC will not change. Infomedia Ltd DIVIDEND REINVESTMENT PLAN RULES 1. COMMENCEMENT OF DRP INFOMEDIA LTD DIVIDEND REINVESTMENT PLAN RULES The DRP and these Rules will commence operation on such date as the Directors determine. (f) Impact of the new rules on awards granted before 1 July 2009. Very generally, ESS plans can now be categorised into the following tax categories. The Company s new path involves a multi-commodity growth strategy that capitalises on its core technical skills, capabilities and experience.